Jake and I had to make the long trek tonight out to the "big Target" and had been wanting to price some appliances (talk about a fun Friday night!) and so as we loaded up and headed out, we were deciding on what low price dining options we could explore. I had been wanting pizza (my mind is programmed that Friday night is pizza night) but didn't want to pay much. Jake wanted a beer (per usual) and cheap needed to factor in there too. 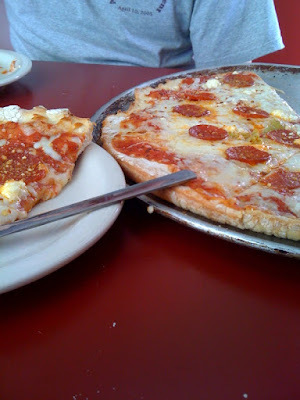 As we headed out East, we got an idea - Lavoro's! My friend and co-worker's family owns Lavoro's and I've been a few times - once or twice for work stuff and a few times with Jake. Lavoro's is a family owned Italian restaurant that is quite unassuming - from the outside you're not quite sure what you're getting into (I think the building must have been a Taco Bell in a prior life). But once you get your food, you'll realize how good it really is. The food isn't fancy but is down right good. And the price you cannot beat. It is a pizza/pasta/sub Italian place and there are a lot of good choices. They make their stuff in house, bread and pasta included, and my friend Amy makes all the desserts. Friday and Saturday nights are $1 draft beers. We got a pizza to share and some of Amy's chocolate raviolis and were stuffed. The pizza was fantastic (and you know how I feel about pizza). We got pepperoni with feta and pepperoncinis. It is a bit far out for usual visits, otherwise I'd go far too often. If you want to try Lavoro's, it is on Sycamore View at Summer. We might go soon because they have a family special - 4 entrees, 4 salads, and bread for $40.